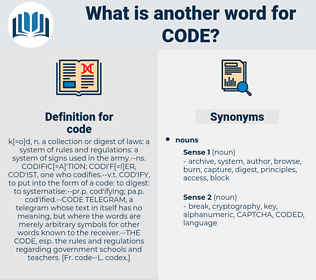 What is another word for code? requirements, decisions, sentences, Schedules, reports, sanctions, Penalties, projects, arrangements, norms, remarks, tribunals, data, Bases, codex, codice. principles, amendments, passwords, instruments, questions, digits, barriers, Persons, queues, plans, Blogs, goods, accounts, states, Penalties, data. coordinates, data, Codifying, codex, codename. documented, codified, concerned, developed, written, determined, intended, used, assigned, requested, Submitted. contains, provides, establishes, applies, Does. And even then - neither is familiar with the other's code! Now there is a clause in the new code forbidding any of the Three Thousand to be put to death without your vote; but the Thirty have power of life and death over all outside that list. universal product code, area code, cypher, cryptograph, access, morse, zip code, secret code, postcode, International Morse Code, cipher, dress code, Morse Code, legal code, omerta, highway code, access code, zip, building code, sanitary code, bar code, color code, health code, fire code, bushido, postal code. coding system, black and white, written language, written communication.